Randy Lake, president of CRH Americas Materials, addressed the National Stone, Sand and Gravel Association (NSSGA) Annual Convention on Feb. 10 for the final time as chairman of the association. Mack Trucks announced the certification of Montreal-based Mack Laval, its third Mack Certified Uptime Dealer in Quebec, Canada, and third French-language location. The accreditation confirms the dealer has met stringent requirements to amplify customer service and uptime. Commercial Construction Economic Summit In Pa.
To allow local governments to adopt green building codes that address high performance as well as conventional sustainable features, the Portland Cement Association and the Institute for Business and Home Safety have developed "High Performance Building Requirements for Sustainability 2.0." Luck Stone Corp. has entered into an agreement to purchase the Jack L. Massie Aggregate distribution center in Williamsburg, Va.
Cemex completed the sale of seven aggregates quarries, three resale aggregate distribution centers, and one concrete block manufacturing facility in Kentucky to Bluegrass Materials Co. The Department of Transportation is giving more than $13.8 million in grants to eight university transportation centers for research and education programs. Willard Salemink is a walking encyclopedia of dredging technology. The 76-year-old founder of Twinkle earned his degree in general science from the University of Iowa in 1961 and began his career in steel fabrication. He launched Assemblers Inc, which concentrated on the design and construction of aggregate processing equipment including crushers, screens and conveyors. 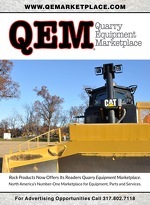 Caterpillar has earned the 73rd spot on Newsweek's Green Rankings; the magazine ranked the top 500 companies. Texas Industries financial results for the quarter ended Aug. 31, show net income was $1.7 million. The first bC India—a Bauma Conexpo international trade fair for construction, building-materials and mining machines, and construction vehicles—has now been scheduled to take place between 8 and 11 Feb. 8-11, 2011. Democrat Timothy Bishop has represented the eastern end of New York’s Long Island since 2002. He serves on the budget committee and the transportation and infrastructure committee, putting him in right in the thick of the debate over the next transportation-funding bill. I asked him about the bill before Congress’ August recess. Amid a global economic downturn, aggregate operations need to do everything they can to improve operating efficiencies and reduce costs. At the heart of plant operations is the conveyer system—an excellent first checkpoint when seeking to optimize productivity. Metso will supply a complete fine crushing and screening system to Norsk Stein's Jelsa quarry expansion in Norway. U.S. Concrete has sold its four ready-mixed concrete plants in Sacramento, Calif.
NSSGA is extending its deadline to register for a chance to win a weekend for two in Cincinnati until 5 p.m. on Wednesday, Sept. 23. Visit http://www.nssga.org/c4yourself/ today and register. Package includes two free nights at the NSSGA convention hotel, the opportunity to experience the convention spouses tours, meals at local restaurants and a chance to see the Bengals play the Texans, eight rows from the field. Limestone trade on the Great Lakes continues a steady decline, according to the Lake Carrier's Association. During one of the many peaks of oil consumption in our country, I worked with a company that manufactured the grinding teeth for oil well drill bits. The National Ready Mixed Concrete Association awarded Aggregate Industries with the 2009 Grand Prize Award for Environmental Excellence. Cemex, Lafarge Protested In U.K. So, here's my breakthrough proclamation: The gas-tax system of funding roads doesn't work. There. You heard it here first, in the pages of Rock Products. As public communication continues its migration to the Internet, public relations practitioners continually need to reconsider their strategies and tactics. At a large aggregate plant, it's impressive to see miles of conveyors stretching high above the ground where screens are stacked on top of screens. Primary, secondary and tertiary crushers bust and grind material to near dust to be segregated into mountainous stockpiles. These giant anthills, silhouetted by the sunset, can be admired from the tops of catwalks as monuments to a job well done. Granite Construction launched a new organizational structure designed to improve operating efficiencies and better position it for long-term growth. Lippmann's 6500LP crushing plant offers a larger feeder, larger impact crusher and larger screen deck combine to make the 6500LP the highest producing plant for its size in recycle crushing, the company reports. Telsmith's QuarryTrax Model TI6060 is a track-mounted, primary impact crushing plant designed for production of up to 800 tph. 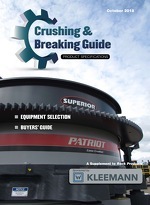 The plant features the Telsmith Model PA6060 primary impact crusher and a massive, solid-type rotor set on oversized 220-mm-wide series bearings. Bridgestone Bandag Tire Solutions (BBTS), Muscatine, Iowa, reports that initial customer use data is now available for the Continuum C1073 retread tire. The value of new construction starts advanced 6% in July 2008 to a seasonally adjusted annual rate of $578 billion, according to McGraw-Hill Construction. More Dust Regs On The Way? 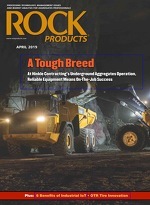 Increasingly, flexibility and equipment uptime are at a premium as aggregate producers try to get the most profitability from larger and larger quarries.